Famous for its karst formations, this magnificent region with its variable curves is home to one of China’s largest minorities. It is also Mao Zedong’s native province. Embalming by the pure mountain air and advancing to the rhythm of the dance steps, you can only be captivated by this place that lets you glimpse only a tiny part of its richness. Flight or train to Zhangjiajie. Welcome your driver (without guide) then transfer to your hotel near Wulingyuan Park at Zimu Shan Zhuang Hotel located at the foot of the mountain. First free discovery around the park. Full day tour of Zhangjiajie National Park, a UNESCO World Heritage Site since 1992. The Tianzishan Cable Car will transport you to the top of the mountain to visit the mountainous Tianzi region dotted with nearly 100 natural and 2000 platforms. stone tops and dozens of waterfalls and springs. Shentangwan and then Yuanjiajie’s point of view, whose landscapes inspired the film Avatar, including a beautiful natural bridge. Descent by Bailong elevator. At a height of 326 meters, this elevator is supposed to be the highest outdoor lift in the world. It takes 1.58 minutes to transport travelers from the bottom to the top of the Yuanjiajie Mountain Ridge. Wulingyuan at Zimu Shan Zhuang Hotel. In the morning visit the Grand Canyon of Zhangjiajie with its breathtaking walls and waterfalls. You can go down in giant slide (4 minutes of descent!). Depending on the weather and your desire you can access the brand new glass bridge with a bird’s eye view above the gorge (not included in the price, supplement of 150RMB / pers). In the afternoon, a 3-hour drive to the old town of Furong. Visit of the historic center. Overnight in Furong at the Bian Cheng hostel near the old city (standard comfort, nice rooms). Day visit to the Dehang region, first discovering the local Furong market, then passing through the suspension bridge of Aizhai, the sixth highest in the world. Walk to the platform called “questioning paradise” (2 to 3 hours round trip). 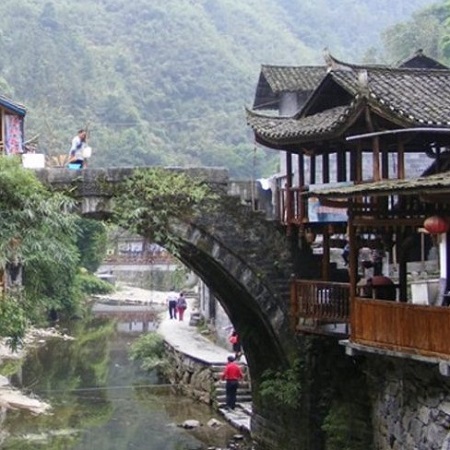 After lunch, visit the Liusha waterfall, and enjoy a show on the customs of the Miao minority, with songs and dances. 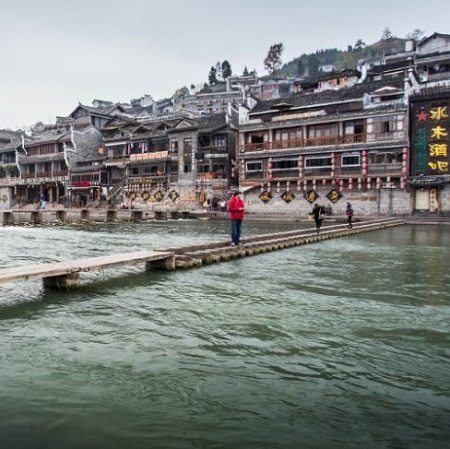 Continue to Fenghuang Old Town, center of the Miao ethnic minority. 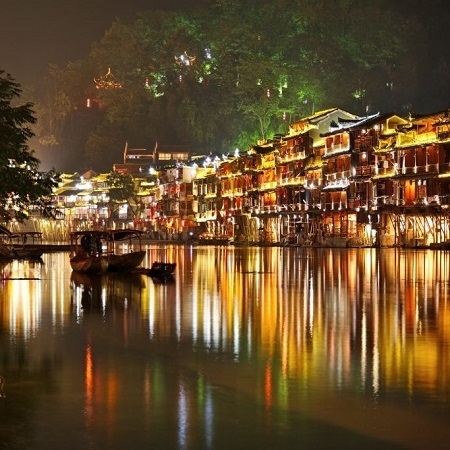 In the evenings, you can dine in one of the quaint overwater restaurants overlooking the illuminated Tuo River. Overnight at Ban Muyun Tian Hotel. The bravest can get up early to see the old town without tourists. Visit of artist Liu Da Pao who produces amazing fabrics thanks to the process of batik. Lose yourself through the many small streets of the city. 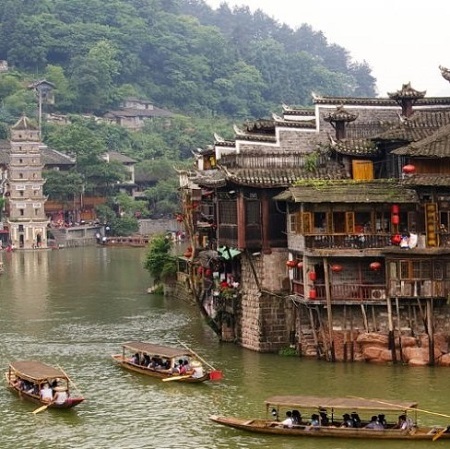 Boat trip possible on the river (not included, extra + 150RMB / pers). After lunch, return to Zhangjiajie. On the way you will take a walk in the Zuolong Gorge, less visited by Chinese groups, but worth the detour. Overnight in downtown Zhangjiajie in Standard Hotel. In the evening, optional sound and light show possible “Tianmen Fox Fairy” (supplement of 250RMB / pers). Overnight at He Tian Wan Hotel (Central Standard in town). This morning ride Tianmen Mountain by taking the longest cable car in the world (7455 meters). The mountain, 1518 meters above sea level, is the highest mountain in Zhangjiajie. Short walk to the Tianmen Cave and an arch made famous by Russian pilots having crossed it by plane. Descent of the mountain by cable car, then transfer to the station or airport for your transfer to your next destination.